Sorry this was a day late and half the weekend is over. I was extremely busy as I volunteered and walk a 5K in support of the March Of Dimes, went to the movies and saw Mother's Day (its a feel good movie, you'll enjoy it), took my dog on a walk through the neighborhood and checked out an open house, and finally went to work for eight hours. Enough about me though, the story I have for you will keep you hooked to the last word and you'll wonder where your sunday went! I was born as a big ball of energy, fed by yellow sun, with the potential to move worlds. I channeled that power and found a force, a speed force. It swallowed me up and shaped me into who—or what—I am now. I told the strangers who found me that an experiment gave me my powers. I lied. No one can ever know that I, Wally, am cut from the same cloth as the man of steel. Cool right?! The Kid we know as Wally West AKA Kid Flash is a kryptonian! I was honestly hesitant, but so curious and once I began to read, I couldn't stop! It was addicting! I loved the emotion and Wally as a character. 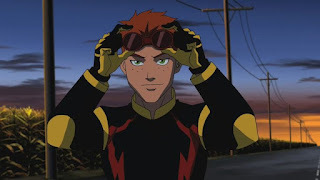 Wally is so different and yet slowly I can see him becoming the one we love from the Young Justice series! The story is not done, but the chapters are formed in such a way that you'll be satisfied at the end of each chapter, but an overwhelming thrill will overtake you when a new chapter is posted! If you decided to read this story, if you decided to review this story please post ' #IAO_FG ' in your review to show My Blog sent you! Thank you! And Enjoy! ---on another note... I just read 25 chapters of Wally's Justice by SpritelyGryffindor, it was really good!